Today is officially the last day of Sweet Pea DSP cards. So I combined challenges for this one. It's for the Splitcoast sketch #278 here, and the PPA#40 Monochromatic Blues Challenge here. This came together really fast cuz I just traced the square sizes onto the card stock and papers then cut them out. 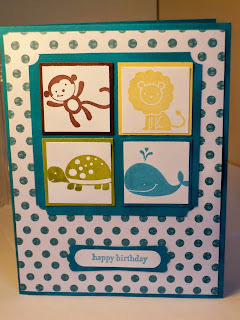 I stamped the circle piece from Circle Circus in Taken with Teal then punched it out with the 1 inch circle punch. 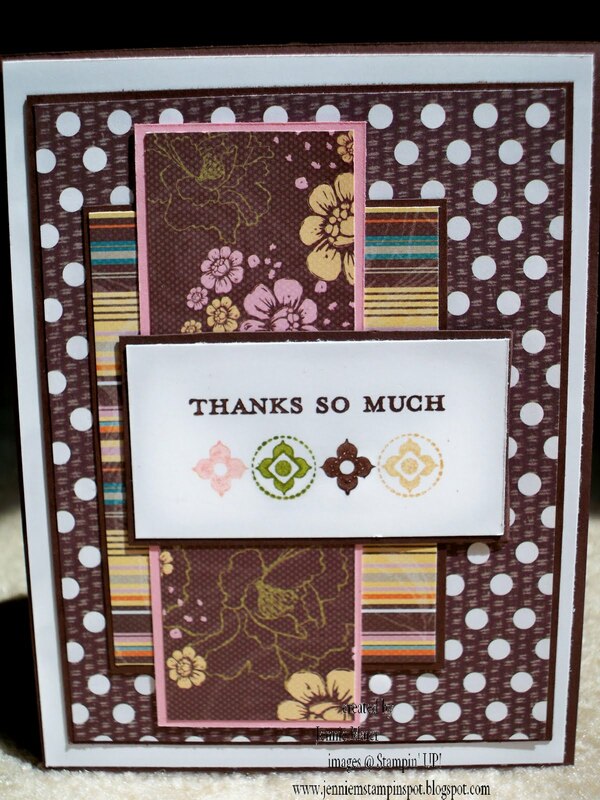 A Taken with Teal piece behind it was punched with the 1 1/4 inch circle punch and popped up with Stampin dimensionals. "Get well wishes" from Teeny Tiny Wishes was stamped in Taken with Teal, punched with the Word Window punch and layered onto a Modern Label punch. I just can't stop using my Sweet Pea DSP stack and Sweet Pea stitched felt flowers! I'm so sad they'll be gone after tomorrow! So I made this one for the MOJO Monday sketch #136 here. 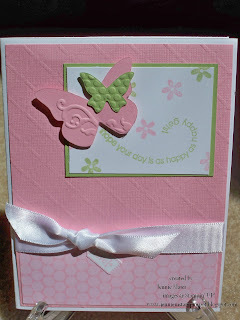 I started with a Rose Red card stock base and layered on a piece of Pretty in Pink. Then I used some patterned papers from the Sweet Pea DSP stack. "Just for you" from Teeny Tiny Wishes was stamped in Chocolate Chip ink on Rose Red card stock then punched out with the Curly Label punch. The Rose Red scallop circle is from the Scallop Circle #2 Big Shot die and there's a 1 3/4 inch circle punched out of Whisper White. A flower from the Sweet Pea stitched felt tops it off. Finally, a piece of 5/8 inch Pretty in Pink satin ribbon finishes it off. This quick and cute graduation card was made using a sketch, SASC44 here, from Stampin Addicts, and Color Combo #268 from Splitcoast here. The color combo is Barely Banana, Ballet Blue and Old Olive. I started with a base of Old Olive then layered on a piece of patterned paper from the Sweet Pea DSP stack. Then on each piece of colored card stock I used the star stamp from the Starring You stamp set. 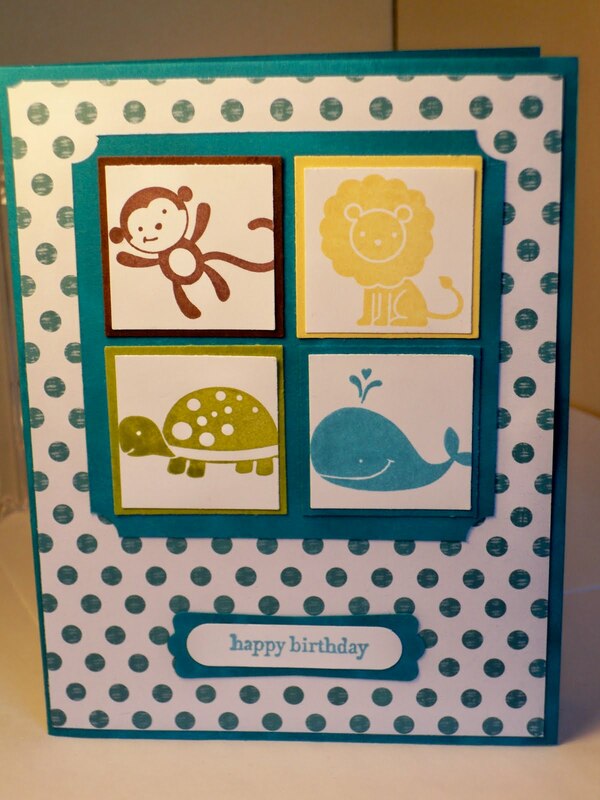 I used Barely Banana, Ballet Blue and Old Olive Classic Stamp pads respectively on each rectangle of card stock. 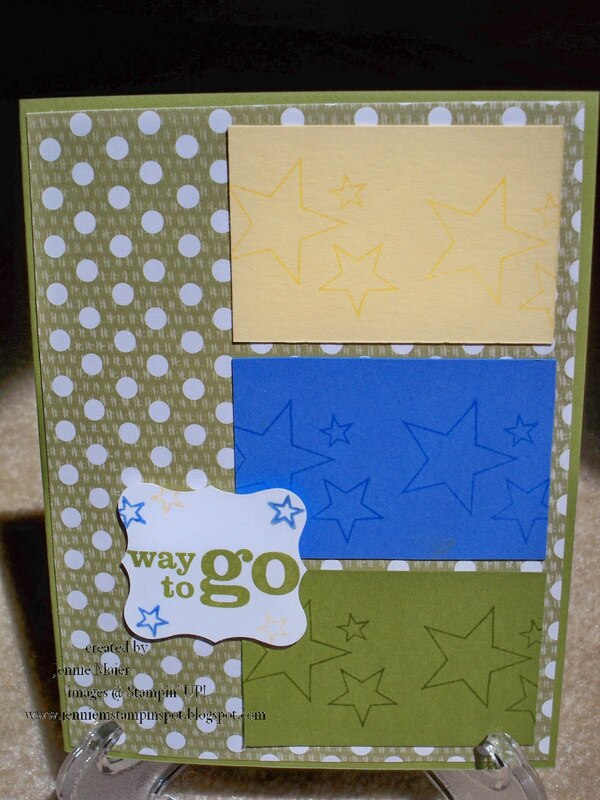 The "way to go" sentiment was inked in Old Olive and punched out with the Curly Label punch. Then the stars were stamped in Barely Banana and Ballet Blue. 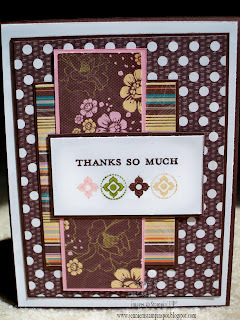 Finally, that label was popped up with Stampin dimensionals. Here's a card I made for Mother's Day and for the Stamping 411 sketch #148 here. Hopefully the lovely lady that I'm giving this card to won't be "blurfing" anytime soon. I started by running a piece of Pretty in Pink textured card stock thru the Big Shot with the Perfect Details texturz plate. 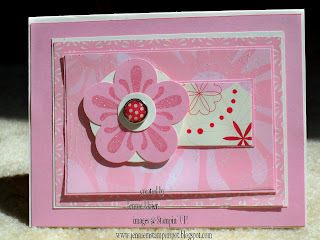 Then I added a piece of pink patterned paper from the Shades of Spring DSP. 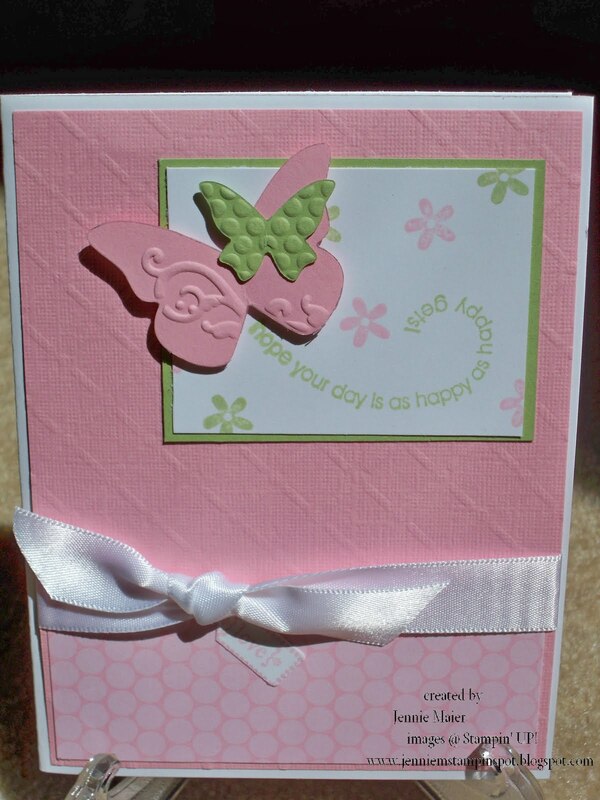 I stamped the sentiment from Flight of the Butterfly in Certainly Celery and added flowers in Celery and Pretty in Pink too. The two butterflies are made from the Beautiful Wings embosslits die. The "love" tag from Tiny Tags was stamped in Pretty in Pink then punched out with the coordinating Medium Jewelry tag punch. Finally, a piece of Whisper White 5/8 inch Satin ribbon finishes it off! I needed some baby girl cards so I thought the Sweet Pea DSP stack and coordinating Sweet Pea stitched felt would be perfect! I used the Splitcoast sketch #277 here too. I started with a Chocolate Chip base then layered on the Sweet Pea DSP according to the sketch. 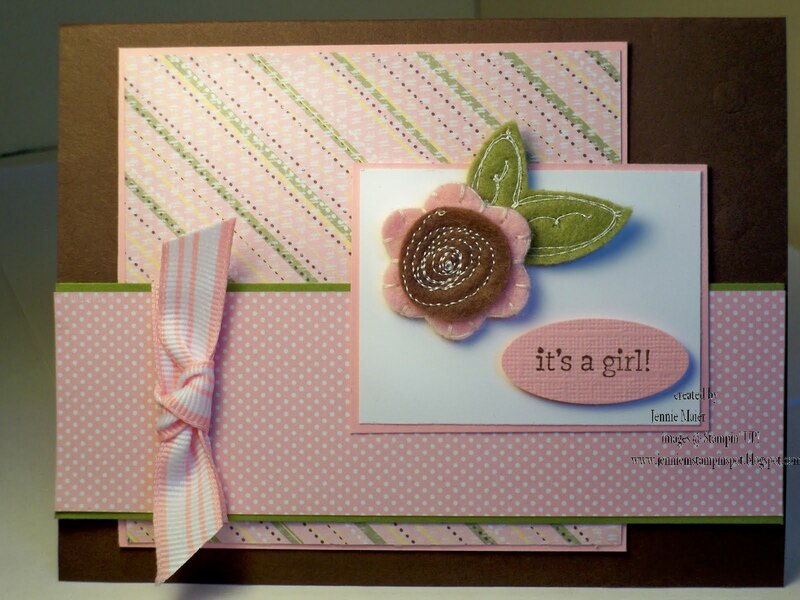 The only stamping is the "it's a girl" from Nursery Necessities which I stamped in Chocolate Chip on textured Pretty in Pink card stock then punched out with the Small Oval punch. I adhered the stitched felt with some glue dots then added a piece of 1/2 inch Pretty in Pink striped grosgrain ribbon. I made today's card for the Splitcoast Sketch #276 here. I was inspired by Connie Tumm's card that I saw on Splitcoast. I used the same colors, Bermuda Bay, Chocolate Chip and So Saffron, and the same stamp set, Eastern Blooms, but I changed things up a bit. I started by running the Bermuda Bay card stock thru the Big Shot with the Perfect Details texturz plates. The lattuce pattern reminds me of a garden trellis. The Chocolate Chip and So Saffron patterned papers are from the Sweet Pea DSP stack. 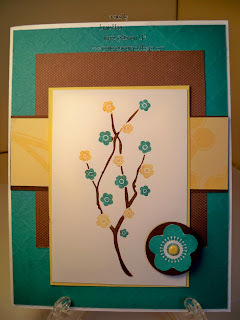 I colored the branch image with Bermuda Bay, Chocolate Chip and So Saffron Stampin Write markers. I stamped the flower image in Bermuda Bay then cut that out, added a Saffron brad to the center and a Chocolate Chip 1 inch circle to the back then popped it all up with a Stampin dimensional. 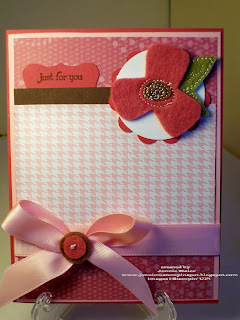 I made this card for the PPA#39 KISS challenge here AND to share a sneek-peek of 5 of the NEW color collection colors. I started this card with a Kraft(soon to be Crumb Cake) base. The bottom of the card has some Early Espresso on it. 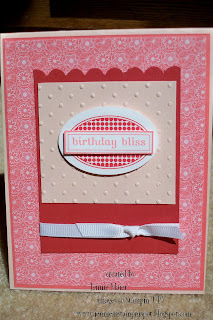 I stamped the image from Birthday Bliss on Whisper White then punched that out with the 1 3/8 inch square punch. I paper pieced the cake image with some Daffodil Delight, Cajun Craze and Cherry Cobbler card stock. I ran the a piece of Daffodil Delight thru the Scallop Edge punch. Then I punched circles of Daffodil Delight, Cajun Craze, Cherry Cobbler and Marina Mist with the handheld, 1/2 inch, 3/4 inch, 1 inch and 1 1/4 inch circle punches. The Marina Mist and Daffodil Delight one has a sliver brad added to the center and one is popped up on Stampin dimensionals. 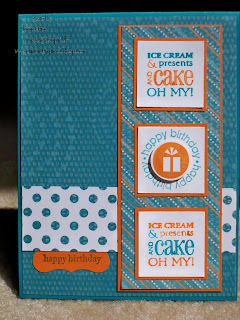 Finally, I stamped Happy Birthday from Teeny Tiny Wishes in Sahara Sand classic ink. Look for more info on the New Color Collection coming soon! Here's a spring-y card I made for the Stamping 411 sketch #147 here. I used the stamp set Flight of the Butterfly with Rose Red and So Saffron inks. The patterned papers are from the Sweet Pea DSP stack. I stamped the sentiment in Rose Red and the little flowers in So Saffron. 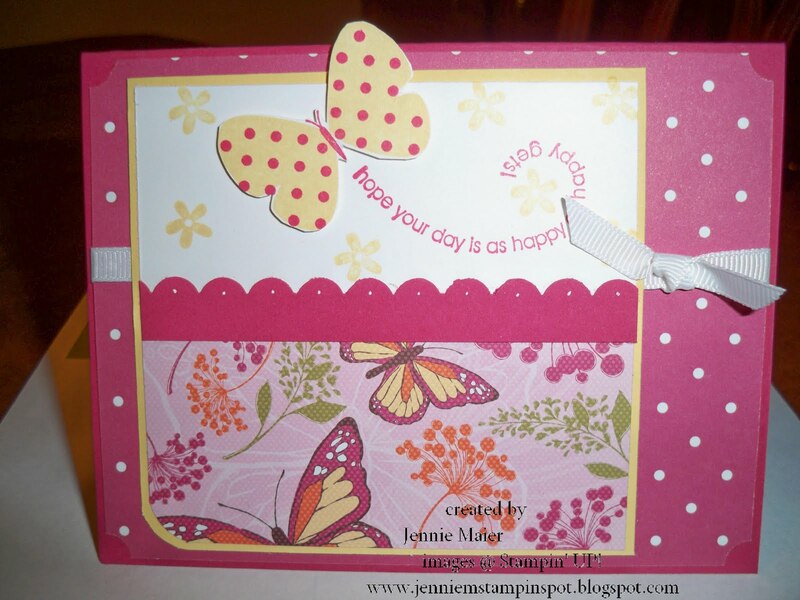 The butterfly was first stamped in So Saffron and then I used the Stamp-a-ma-jig to add the polka-dots in Rose Red. I ran a strip of Rose Red card stock thru the Scallop edge punch and added some dots with a white gel pen. A piece of 1/4 inch Whisper White grosgrain ribbon finishes it off. Okay, here's another Splitcoast sketch, #273 and more Sweet Pea DSP. As you can see, the paper combinations are endless! I used the Very Thankful set as the main image. I colored the sentiment in with the Chocolate Chip Stampin Write marker and the other images with Pretty in Pink, Old Olive and So Saffron. That's it, so cute and quick! With these great sketches that you can just trace onto your card stock and cut out the images that fast! I'm just playing with some sketches I never got around to doing. This one is for SC#273 here. I thought of using the Extra Large fancy flower punch with the stamp set With All My Heart. and the coordinating Sending Love Specialty papers. I used Versamark to stamp the image and embossed it with Iridescent Ice embossing powder. I then punched that out with the Extra Large fancy flower punch.The center of the flower is a piece of Very Vanilla card stock punched with the 3/4 inch circle punch and a Real Red 1/2 inch Sending Love epoxy brad. This birthday card is for the PPA#38 sketch challenge here. I'm really gonna miss the Sweet Pea DSP that I used here but it's such a great value cuz you get so many different patterns. I used 4 stamp sets on this one: Birthday Bliss, Party Hearty, Think Happy Thoughts and Teeny Tiny Wishes. The top and bottom squares were colored with the Pumpkin Pie and Taken with Teal Stampin Write markers then punched out with the 1 1/4 inch square punch. On the middle square I stamped happy birthday in Taken with Teal then added a popped up present image from Party Hearty that I stamped in Pumpkin Pie. Happy Birthday from Teeny Tiny Wishes was stamped in Taken with Teal on Pumpkin Pie card stock then punched out with the Curly Label punch. Here's a quick card for the Splitcoast card sketch #275 here. I used the stamp set Very Thankful. This set is specially designed by Stampin UP! for the Ronald McDonald House Charities and Stampin UP! donates $2 to RMHC for each set purchased. I stamped the image with Basic Black on Whisper White card stock. Then I colored in the turtle with Old Olive ink, blender pens and the Old Olive Stampin write marker. The Rose Red, Taken with Teal and Chocolate Chip markers were also used. The papers are from the Sweet Pea DSP stack. I'm back with Two Challenges! I'm back from an awesome Easter vacation in Florida! It was such nice weather and sooooo relaxing! But, like a true stamper, I did miss my stamping. So to catch up I made this birthday card for two challenges, Stamping 411 sketch #146 here and Splitcoast color combo #266 here. The color combo is Blush Blossom, Cameo Coral and Ruby Red. These are three of the 30 retiring Stampin UP! colors that will be gone after June 30th. If you love them, get them now! I started with a Blush Blossom base, added a piece of Cameo Coral and then a piece of Cameo Coral patterned paper from the Pink Flamingo DSP. I ran a piece of Ruby Red thru the Scallop Edge punch and a piece of Blush Blossom thru the Big Shot with the Perfect Polka dots textured impressions folder. 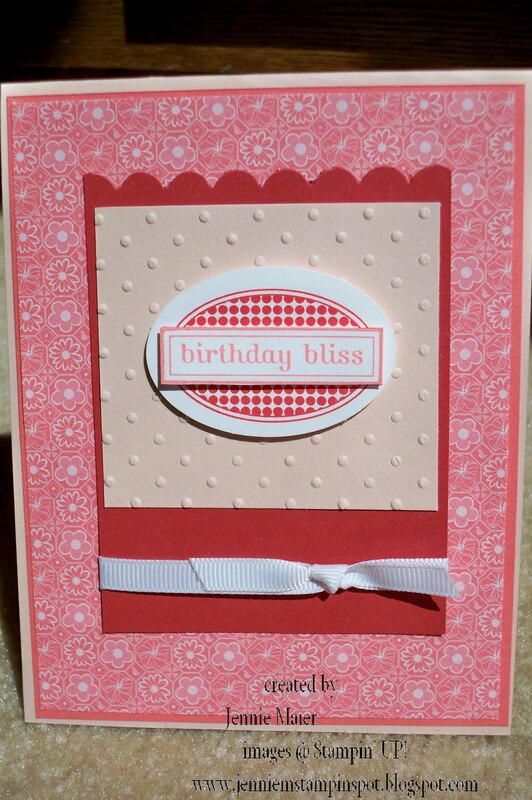 I stamped the Birthday Bliss in Ruby Red and again in Cameo Coral. I punched the main image out with the Wide Oval punch. I then cut out a piece of the Cameo Coral and popped that up with Stampin dimensionals. A piece of 1/4 inch Whisper White grosgrain finishes it off. Here's a simple card using the Fox and Friends set. We're off to Florida for spring break so you won't be seeing any posts for a while. I really love this stamp set and hope they carry it over to the new catty this summer! I stamped the animals in Chocolate Chip, So Saffron, Old Olive and Taken with Teal. I then punched them out with the 1 1/4 inch square punch and layered them onto a coordinating piece of colored card stock punched with the 1 3/8 inch square punch. They were all put on a piece of Taken with Teal that I dressed up with the Ticket Corner punch. The sentiment is from Teeny Tiny Wishes, was stamped in Taken with Teal, punched with the Word Window punch and layered onto the Modern Label punch.